Finally. A solution for the millions of women dealing with menopausal problems. 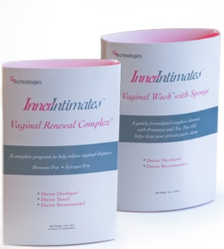 Learn how the inner intimates Vaginal Wash relieves and reinvigorates. Read how consumers can get it complimentary With No Hidden Fees Or Recurring Billing. Natural Medical Supply llc, an online supplement store, provides products such as Inner Intimates Vaginal Renewal Complex to relieve a variety of menopausal symptoms. They are offering the new Vaginal Wash with Sponge for free, exclusively with all Vaginal Renewal Complex orders. There are countless name brand products available for menopause related vaginal dryness. Many of these popular treatments use synthetic oils leading to clogged pores and ingrown hairs among other irritations. The Inner Intimates Vaginal Wash is formulated to provide relief of various discomforts through it's cleansing effects. It is a natural non-abrasive cleanse containing a mild soap with evening primrose and tea tree oil. This natural wash works to prevent dryness, clogged pores, ingrown hairs and other menopausal problems associated with vaginal dryness. Each Inner Intimates Vaginal Wash Kit includes a gentle sponge for exfoliating the vaginal area to help prevent further problems and discomforts. Menopause affects 37.5 million women in the nation, according to Center for Disease Control. Doctors and Grohen Technologies, to provide relief for vaginal symptoms related to menopausal symptoms, created the Inner Intimates Renewal Complex and Wash.
“Many women suffer from menopause symptoms. At Natural Medical Supply, we are proud to carry products that address some of these not often discussed issues and hopefully provide some relief and comfort,” said T. Hall. The online supplement store is excited to offer free shipping and the free vaginal wash exclusively with the purchase of the Inner Intimates Vaginal Renewal Complex. "We are so passionate about what this product can do for women. So we've made it our only product online that has free shipping. We believe this pair of products is what women have been waiting for. We look forward to their ear to ear grin once they try them." said J. Mac Customer Relations Assistant at Natural Medical Supply llc. For more information on Natural Medical Supply and Inner Intimates products visit our Menopause Products Page.